LRRK2 mutations produce end-stage Parkinson’s disease (PD) with reduced nigrostriatal dopamine, whereas, asymptomatic carriers have increased dopamine turnover and altered brain connectivity. LRRK2 pathophysiology remains unclear, but reduced dopamine and mitochondrial abnormalities occur in aged G2019S mutant knock-in (GKI) mice. Conversely, cultured GKI neurons exhibit increased synaptic transmission. We assessed behavior and synaptic glutamate and dopamine function across a range of ages. Young GKI mice exhibit more vertical exploration, elevated glutamate and dopamine transmission, and aberrant D2-receptor responses. These phenomena decline with age, but are stable in littermates. In young GKI mice, dopamine transients are slower, independent of dopamine transporter (DAT), increasing the lifetime of extracellular dopamine. 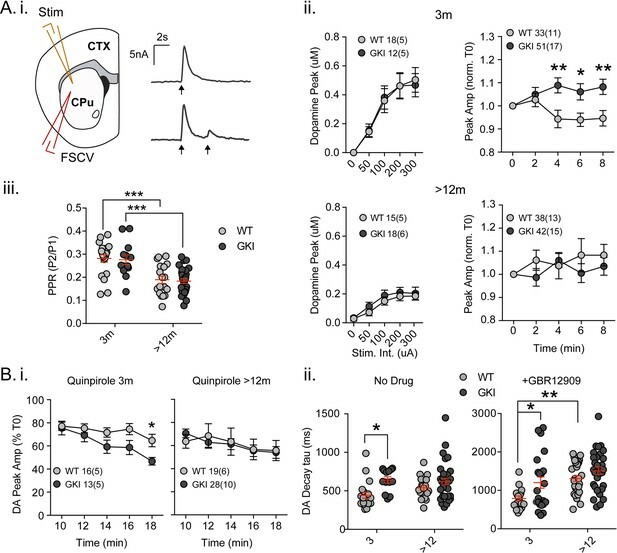 Slowing of dopamine transients is observed with age in littermates, suggesting premature ageing of dopamine synapses in GKI mice. Thus, GKI mice exhibit early, but declining, synaptic and behavioral phenotypes, making them amenable to investigation of early pathophysiological, and later parkinsonian-like, alterations. This model will prove valuable in efforts to develop neuroprotection for PD. Parkinson’s disease (PD) is clinically diagnosed when patients are presented with characteristic progressive motor symptoms, although post-mortem detection of Lewy pathology and nigral cell loss are currently required for confirmation. A recent study suggests nigral cell death may be as low as 0–10% 1–3 years from diagnosis, whereas dopamine functional markers such as tyrosine hydroxylase (TH) and dopamine transporter (DAT) are profoundly reduced at the earliest points assessed (Kordower et al., 2013). The rapid and near complete loss of dopamine functional markers at, or within a few years of, diagnosis argues that ongoing clinical deterioration over several years is due to loss of compensatory mechanisms and/or dysfunction of non-dopaminergic neurons. Although motor symptoms respond well to current therapy (e.g., dopamine replacement by L-DOPA or deep brain stimulation; DBS), PD is a multisystem disorder with a host of L-DOPA unresponsive features. All patients suffer a range of non-motor symptoms, many of which appear to precede motor onset by years or decades (Goldman and Postuma, 2014; Chaudhuri and Schapira, 2009; Jenner et al., 2013; Weintraub et al., 2008a, Weintraub et al., 2008b, Weintraub et al., 2008cWeintraub et al., 2008c; Tolosa et al., 2007). Cognitive dysfunction is seen in ~40% of newly diagnosed PD cases (Broeders et al., 2013; Pedersen et al., 2013; Litvan et al., 2011) in the form of deficits in attention, executive function, verbal fluency and visuospatial processing, rather than memory per se (although memory is also often impaired) (Weintraub et al., 2008b; Goldman et al., 2015). This dysexecutive/subcortical syndrome is thought to be due to impaired cortico-striatal basal ganglia processing for action selection (Goldman and Postuma, 2014; Calabresi et al., 2014; Gerfen and Surmeier, 2011). There are no effective symptomatic treatments for many of these non-motor issues, nor are there currently any disease-modifying (neuroprotective) interventions. While the etiology for most Parkinson patients remains unknown, aside from age, gene mutations contribute the most risk (Volta et al., 2015a). Pathogenic mutations in leucine-rich repeat kinase 2 (LRRK2) account for ~1% of all PD cases, of which LRRK2 G2019S is the most frequent; identified in ~30% of cases in some ethnicities (Ozelius et al., 2006; Hulihan et al., 2008). Affected LRRK2 individuals develop a late-onset, L-DOPA-responsive motor parkinsonism that is clinically and often pathologically indistinguishable from idiopathic PD (Haugland, 2002; Gaig et al., 2014). Dopamine PET imaging of affected LRRK2 mutation carriers reveals progressive neurochemical alterations similar to those of sporadic PD, namely impaired presynaptic dopamine function (Adams et al., 2005; Nandhagopal et al., 2008). Further study in LRRK2 families reveals surprising alterations in clinically asymptomatic, otherwise healthy, mutation carriers, including: (i) early increases in dopamine turnover by PET (Sossi et al., 2010), (ii) changes in cortical connectivity by resting state MRI and neurochemical changes (Adams et al., 2005; Helmich et al., 2015; Vilas et al., 2015), and (iii) alterations in cognitive tests of executive function (Thaler et al., 2013). Advances in our understanding of PD argue cell death and overt motor dysfunction are late occurrences, preceded by dysfunction of dopaminergic and non-dopaminergic systems. In this light, in model systems modelling PD etiology, the underlying pathophysiology and phenotypes should also be expected to be initially subtle, progressive, and include dysfunction of multiple neuronal systems, prior to cell loss. We engineered the LRRK2 G2019S substitution into the endogenous mouse gene (G2019S knock-in mice; GKI) which produced reductions in basal and pharmacologically evoked nigrostriatal dopamine release in vivo in mice aged >12 months by microdialysis (Yue et al., 2015). This Parkinson’s-like deficit was not observed at 6 months, and occurred despite a normal compliment of nigral neurons and nigrostriatal dopamine markers (TH). Contrastingly, in cortical neurons cultured from the same GKI mice, we observed increases in glutamatergic and GABAergic synaptic transmission at 21 days in vitro (Beccano-Kelly et al., 2014). To investigate this disparity, we probed dopamine and glutamate release, neuronal morphology, synaptic proteins and behavior in young and aged GKI mice. Young animals exhibit increased exploratory rearing behavior and increases in striatal glutamate and dopamine transmission. As GKI mice age, they exhibit less exploratory rearing and reductions in both glutamate and dopamine transmission. However, extracellular lifetime of single dopamine release events is enhanced in young GKI animals and maintained in aged animals, at which point wild-type littermate values have increased to parity. Several measures demonstrate that the LRRK2 G2019S mutation produces alterations in young adult mice, most of which decline with age, prior to ages where hypodopaminergia, mitochondrial and tau pathology are observed. We provide further evidence that GKI mice provide a valuable model in which to probe early pathophysiological effects of mutant LRRK2 and later classically PD-like deficits. We conclude that understanding the early pathophysiological changes in etiological models may offer the best hope for development of neuroprotection in PD and related diseases. Recently, Longo et al. (2014) reported that a similar line of homozygous GKI mice weighed significantly less (~15%) than littermates (Longo et al., 2014). This conclusion was drawn from longitudinal observations on a cohort of 11 mutants and 9 WT littermates, and separate age-matched comparisons of 6–8 mice per group. We did not detect genotype-dependent weight alterations in our founding colony at Mayo Clinic, Florida (Yue et al., 2015). Here, we found no reductions in weight in comparisons of multiple litters in the UBC colony, over a wide range of ages (Figure 1A. total animals WT n = 171, GKI heterozygous n = 276 mice and see Figure 1—figure supplement 1. GKI homozygous n = 162). Conversely, while GKI mice were indistinguishable from WT littermates for up to 500 days, a significant genotype-age interaction was detected due to small but significant increases in mean weight of both heterozygous and homozygous GKI animals at 500–600 days (Figure 1A. ; 2-way ANOVA, genotype F(2,588)=1.8, p=0.17, interaction F(12,588)=1.7, p=0.049, and see Figure 1—figure supplement 1). LRRK2 G2019S parkinsonism is inherited as a Mendelian dominant condition and manifests in heterozygous carriers (Trinh et al., 2014; Kachergus et al., 2005). Therefore, we focused our effort on comparatively large cohorts of male WT littermate and heterozygous GKI (herein GKI) mice. Based on our previous results (Yue et al., 2015) we chose to examine two life stages; early ages when striatal dopamine levels were previously normal by microdialysis (1–6 months;<6 m) and an aged time point when striatal dialysate dopamine levels were reduced (12–18 months;>12), but prior to detection of mitochondrial abnormalities (observed at >22 months [Yue et al., 2015]). 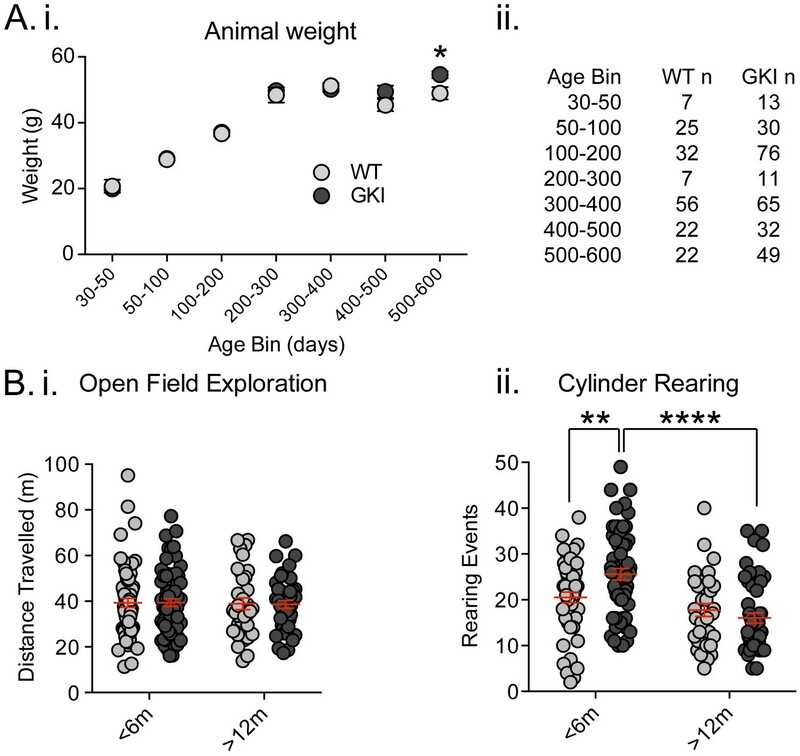 Increased exploratory behavior in young GKI mice declines with age. (A) Animal body weight over time. There was no main effect of genotype upon mouse weight, but there was a significant interaction between weight and age (see text and Figure 1—figure supplement 1). Weights were not significantly different at any age up to 500 days (i; animal n shown in ii); however, in the oldest age group there was a statistically significant increase in GKI mean weight (post-test *p=0.018). (B) Spontaneous exploratory behavior in young and old mice. Analysis of open field exploration showed no genotype (p=0.9) or interaction (p=0.9) effects on total distance travelled (i). In the cylinder test for vertical exploration (ii) there was a significant interaction between genotype and age upon rearing events (p=0.008). At < 6 months, GKI mice exhibited a significant 24.8% increase in vertical exploration (post-test **p=0.009), which declined significantly with age (post-test ****p=0.0001). No significant age-related decline was observed in WT littermates (post-test p=0.3). Longo et al. (2014) found homozygous GKI mice exhibited hyperactivity at all ages tested (Longo et al., 2014); although such a result might be impacted by lower body weight in mutants. In agreement, we previously observed an increase (~10%) in open field activity in a small cohort of homozygous GKI mice at 6 (but not 12) months in the founding colony (Yue et al., 2015); whereas hyperactivity was not observed at any age in heterozygous mice (Yue et al., 2015). Here we tested large cohorts in the open field exploration task and, in agreement with our previous report, found no significant effects (Figure 1B.i, WT n = 66 and 34, GKI n = 72 and 44, for <6 and >12 months, respectively; 2-way ANOVA: F(1,212)=0.09, 0.002, 0.007 and p=0.8, 0.9 and 0.9 for age, genotype and interaction, respectively). We similarly found no evidence for thigmotaxis at either age point, suggesting a lack of anxiety- or anxiolytic-like phenotypes, which may have altered open field exploration (center path ratios were not significantly different). Contrastingly, in the cylinder exploration test conducted in a smaller environment that may stimulate mice or relieve some stress of open field testing, we found significant age and age-genotype interaction effects (Figure 1B.ii, WT n = 50 and 33, GKI n = 59 and 49, for <6 and >12 months, respectively; 2-way ANOVA: F(1,187)=23.6, 7.3, and p=0.0001, 0.008 for age and genotype-age interaction, respectively). Post-test analysis demonstrated a significant ~25% increase in rearing events in GKI mice aged <6 m, relative to WT littermates (p=0.009). This phenomenon was significantly reduced with age in GKI mice (p=0.0001) but not WT animals (p=0.3). Together, the behavioral data demonstrate that the G2019S mutation (at disease-relevant heterozygous physiological expression levels) results in alterations to behavior in young adult mice, independent of changes to animal weight. Here, in GKI mice, this manifested as early increases in exploratory rearing without changes in open field exploration and thus likely reflects altered motivation for exploration, rather than motor function per se. We conclude, in broad agreement with previous reports (Yue et al., 2015; Longo et al., 2014), that GKI mice have a propensity to exhibit hyperactivity, but one that is context dependent. Future experiments examining exploration in more complex environments and/or cognitive tasks may prove enlightening at young and aged time points. Glutamate release is augmented in networks of cultured GKI cortical neurons, as demonstrated by a > 35% increase in miniature excitatory postsynaptic current (mEPSC) frequency at 3 weeks in vitro (Beccano-Kelly et al., 2014). To determine whether similar alterations to cortical/thalamic glutamate release occur in the GKI mouse brain, we conducted whole-cell patch-clamp recording of dorsolateral striatal medium-sized spiny projection neurons (MSNs or SPNs; referred to herein as SPNs) in slices acutely prepared from young and aged GKI and WT littermate mice (Figure 2). Intrinsic membrane properties were as predicted for SPNs (Beccano-Kelly et al., 2015; Milnerwood et al., 2013; Milnerwood et al., 2010) and, although there were statistically significant age effects upon membrane capacitance (Cm), membrane resistance (Rm) and decay time constants (Tau m), there were no genotype or genotype-age interaction effects (see Figure 2—figure supplement 1; 2-way ANOVA values included). Thus, intrinsic membrane properties of SPNs are not altered by the presence of G2019S LRRK2. Increased glutamate transmission onto young GKI striatal projection neurons declines with age. (A) Whole-cell voltage-clamp (WC VC) recording in striatal medium-sized spiny projection neurons (SPNs) of the dorsolateral striatum of acutely prepared brain slices. Recording electrodes targeted visually identified SPNs in the dorsolateral caudate putamen (CPu) of the striatum and stimulating electrodes were placed intrastriatally ~200 um dorsal of the recording site toward M1/S1 cortex (CTX) (i). Example traces of spontaneous activity (spontaneous excitatory post-synaptic currents: sEPSCs) in slices from 1m-old WT (left) and GKI (right) mice. There was a significant main effect of age upon mean sEPSC amplitude (ii, p=0.049), but no main genotype (p=0.15) or age-genotype interaction (p=0.18). In contrast, there were significant main age (0.0001) and genotype (p=0.013) effects and an age-genotype interaction effect (p=0.006) upon the frequency of sEPSCs. At 1–3 months, GKI SPNs exhibited a significant 48.4% increase in mean event frequency (post-test **p=0.0004), which significantly declined (by 57%) with age (post-test ****p=0.0001). In contrast, the 13% decline with age in WT SPNs was not significant (post-test p=0.29). (B) Representative traces of intrastriatally-evoked AMPA- and NMDA-receptor mediated EPSCs (eEPSCs) recorded at Vh −70 mV and + 40 mV, respectively (i). There was a significant main effect of age (ii; p=0.041) upon the ratio of AMPA to NMDA eEPSC amplitudes, but no main genotype (p=0.96) or age-genotype interaction effect (p=0.92). (C) Representative peak-normalized traces of evoked EPSCs (eEPSCs) in SPNs, resulting from intrastriatal paired-pulse stimuli (20–140 ms inter-pulse intervals; IPIs) prior to (i. black trace) and in the presence of 10 uM quinpirole (red trace; slices from 1 month WT and GKI slices). There were no significant genotype or genotype-IPI interaction effects upon paired-pulse ratios in pooled experiments from animals aged 1–3 months in standard conditions (ii). In the presence of the D2 agonist quinpirole (i) there was a significant main genotype effect (*p=0.042) in slices from 1 m old mice (iii). Analysis of spontaneous EPSCs (sEPSCs, Figure 2A) revealed a significant main age effect upon event amplitude (Figure 2A.i. 2-way ANOVA; F(1,165)=3.92, p=0.049, WT n = 40(17) and 31(12), GKI n = 53(20) and 44(15), for 1–3 and >12 months, respectively), but no genotype or genotype-age interaction effects (F(1,165)=2.1, 1.8, p=0.15 and 0.18, respectively). Contrastingly, analysis of sEPSC frequencies revealed significant main genotype and age effects (Figure 2A.ii. 2-way ANOVA; F(1,165)=6.3, 17.3, p=0.013, 0.0001, respectively), and a significant interaction between genotype and age (F(1,165)=7.8, p=0.006). Post-tests demonstrated a significant ~47% increase in sEPSC frequency in GKI SPNs aged 1–3 months, relative to WT littermates (p=0.0004). This phenomenon was significantly reduced with age in GKI mice (p=0.0001), but not WT animals (p=0.6). To more discretely interrogate the age-dependency of this large increase in sEPSC event frequency, comparisons were made between GKI and WT data sets in approximate 1, 3, 12 and 18 month groupings (Figure 2—figure supplement 2, RM-ANOVA values included); inter-event interval cumulative probabilities demonstrated that frequency is higher in GKI SPNs at 1 and 3, but not 12 or 18 months of age. A recent report by Matikainen-Ankney et al. (2016) also found a similar increase in SPN event frequency in slices from similar GKI mice (aged < 1 month) (Matikainen-Ankney et al., 2016), which was concluded to be predominantly due to action potential-mediated transmission (only a strong trend toward increased frequency was observed in the presence TTX). We have previously demonstrated that sEPSCs in our coronal slice preparation are TTX-insensitive, and thus predominantly miniature EPSCs (mEPSCs) (Milnerwood et al., 2010); however, the possibility remains that an increase in basal GKI event frequency is due to anomalous preservation of action potential-dependent release. We found that GKI event amplitudes and frequencies were insensitive to TTX application (Figure 2—figure supplement 3), with only a weak trend toward increased (not reduced) frequency following blockade of action potential firing. We conclude that sEPSCs in GKI slices are predominantly, if not entirely, independent of action potentials and therefore represent miniature release. A simple explanation for increased glutamatergic event frequency is an increase in the number of synapses (with equal release probability); however, we found no significant genotype effect upon postsynaptic dendritic spine-like structures (quantified from Golgi impregnation), or immunohistochemical staining of presynaptic vesicular glutamate transporters 1 and 2 (VGluT1, VGluT2; Figure 2—figure supplement 4). Thus, similarly to glutamatergic mEPSCs in cortical cultures at 3 weeks in vitro (Beccano-Kelly et al., 2014), GKI SPNs in slices from young mice exhibited no difference in sEPSC event amplitude but significant increases in event frequency in the absence of changes to synapse numbers. These specific early increases in glutamate release frequency (as opposed to event amplitude) are not maintained in SPNs of slices from older animals; in agreement with Matikainen-Ankney et al. (2016) who also report no changes to synapse density (Matikainen-Ankney et al., 2016). Synchronous glutamate release was also investigated by intrastriatal stimulation-evoked excitatory postsynaptic currents (eEPSCs; Figure 2B and C). While raw amplitudes of eEPSCs are difficult to interpret (due to potential differences in stimulating electrode placement), within-cell measures such as the ratio of AMPA-receptor mediated (Vh −70 mV) to NMDAR-mediated (Vh + 40 mV) current amplitudes (AMPA:NMDA ratios) and paired-pulse ratios (PPRs) are widely used to estimate postsynaptic responsiveness and presynaptic release probability, respectively. Although there was a significant effect of age, we found no significant genotype effect upon AMPA:NMDA ratios of GKI and WT eEPSCs (Figure 2B, 2-way ANOVA; F(1,106)=4.3, 0.002, p=0.041, 0.97 for age and genotype, respectively). In the face of elevated glutamate event frequency, a lack of change in the ratio (AMPA responsiveness and synapse numbers) is often interpreted as evidence for alterations at the presynaptic terminal. Paired-pulse ratios (often seen as indicative of presynaptic release probability) were not significantly altered by genotype in slices from young (Figure 2C.i and ii, 2-way RM-ANOVA; F(1,96)=0.51, p=0.47) or aged mice (Figure 2—figure supplement 5, 2-way RM-ANOVA; F(1,96)=0.51, p=0.47). Several reports demonstrate a disconnection between alterations in miniature event frequency and predicted changes to PPRs (Milnerwood et al., 2013; Cepeda et al., 2008; Sara et al., 2005; Ramirez et al., 2012; Crawford and Kavalali, 2015; Milnerwood and Raymond, 2007; Parisiadou et al., 2014; Mei et al., 2016; Akopian and Walsh, 2007) and recent evidence suggests the mechanisms for miniature and synchronous release may be distinct (reviewed in [Crawford and Kavalali, 2015]). Therefore, specific alterations to spontaneous release may entirely underlie the increase observed in GKI slices. Alternatively, paired-pulse facilitation ratios are reduced (and release probability is increased) in thalamostriatal, relative to corticostriatal, terminals (Ding et al., 2008; Sciamanna et al., 2015). Thus, altered contributions of one or both pathways might account for observed differences in young (and potentially masked differences in old) GKI slices. Ongoing experiments selectively probing spontaneous and evoked miniature release in both pathways may prove informative. Upon intrastriatal stimulation, glutamatergic terminals (and, by inference, PPRs) are subject to modulation by the simultaneous release of dopamine (Bamford et al., 2004), among other transmitters. In slices from LRRK2 overexpressing mice, we found PPR alterations were dependent upon the activity of presynaptic D2 receptors (Beccano-Kelly et al., 2015). Here, in the presence of the D2 receptor agonist quinpirole (Q; 10 uM, bath applied) we found a significant main effect of genotype upon PPRs; GKI currents were reduced relative to WT controls (Figure 2C.iii, 2-way RM-ANOVA; F(1,17)=4.8, p=0.042), indicative of a relatively higher initial release probability at GKI synapses, when D2 receptors were stimulated in both genotypes. This difference is likely due to D2 agonism having increased WT PPRs in this subset of cells (n = 9 (3); 2-way RM-ANOVA treatment F(1,32)=7.5, p=0.01 before vs. after quinpirole), by presynaptic D2 negative tuning of initial release probability (and resultantly increased PPR) (Beccano-Kelly et al., 2015; Bamford et al., 2004). Conversely, quinpirole had no effect on PPR in GKI (Figure 2—figure supplement 5), suggesting that D2 negative tuning upon presynaptic terminals is dysfunctional, or saturated, at GKI synapses. The D2 antagonist remoxipride (10 uM, bath applied) also had no significant effect upon GKI PPRs (Figure 2—figure supplement 5); suggesting that acute D2 activation on glutamatergic terminals is dysfunctional, not saturated. This loss of dopamine-dependent negative regulation may contribute to basal increases in GKI event frequency at this young age, if intrinsic differences in glutamate release are beyond modulation by this form of negative regulation (Bamford et al., 2004). SPNs are equally subdivided by postsynaptic D1 or D2 dopamine receptor expression and form the direct and indirect striatal output pathways, respectively. Paired-pulse ratios were initially shown to be elevated in direct pathway SPNs (Kreitzer and Malenka, 2007), and although subsequent reports found no difference in PPRs (Cepeda et al., 2008; Ding et al., 2008), miniature EPSC frequencies appear consistently higher in D2 indirect pathway SPNs (Cepeda et al., 2008; Kreitzer and Malenka, 2007). To visually target D1 (red) and D2 expressing striatal SPNs, a subset of GKI mice were crossed with line 6 Drd1a-tdTomato ± mice (Ade et al., 2011) and cell filling during recording and post hoc staining were conducted to verify visual calls. We found no cell-type or age-effect on sEPSC event frequencies of D1 or D2 SPNs in slices from GKI mice (Figure 2—figure supplement 7, 2-way ANOVA; F(1,19)=1.23, 0.56, p=0.21, 0.46 for cell type and age, respectively). We also found that quinpirole application did not have a consistent effect upon eEPSC amplitude or paired-pulse ratios in either D1 or D2 SPNs from GKI mice (Figure 2—figure supplement 7). Similarly, remoxipride had no effect upon event amplitude or frequency in GKI SPNs (Figure 2—figure supplement 6). Together the data suggest that presynaptic glutamate transmission onto SPNs of GKI mice is augmented (due to altered release, not changes in synapse number) at an early age when presynaptic D2 tuning is also dysfunctional. These initial levels of activity decline over the animals’ lifetime, unlike WT SPNs. We previously found a significant reduction in basal extracellular dopamine levels in GKI mice aged 12, but not 6 months (Yue et al., 2015). As no differences in the total amount of dopamine were detected, reduced extracellular dopamine in old animals was interpreted as a latent impairment of dopamine release. In light of age-dependent alterations to glutamate transmission, we resolved to test dopamine release directly by fast-scan cyclic voltammetry in the dorsolateral striatum young and aged mice (Figure 3). Single pulses evoking dopamine release by increasing stimulus intensities (50 - ~450 uA, 0.01 Hz) revealed similar peak currents and calibrated extracellular dopamine peak concentrations in slices from young GKI and WT animals; there was no effect of genotype (Figure 3A.i and ii. 2-way ANOVA; F(1,140)=0.001, p=0.97). Single pulse evoked dopamine release had declined by approximately 50% in aged animals, (Figure 3A.ii), but again there was no effect of genotype (2-way ANOVA; F(1,141)=1.79, p=0.18). The data suggest there is no basal impairment to stimulated dopamine release in aged GKI mice, despite reduced extracellular dopamine in vivo. To assess the stability of dopamine transmission, single stimuli were set to evoke ~70% maximum release every 2 min (0.01 Hz; Figure 3A.ii). Over 10 min, in slices from young animals, we found a significant main effect of genotype (2-way RM-ANOVA; F(1,53)=8.5, p=0.005), and a significant interaction between genotype and pulse number (F(4,212)=4.0, p=0.003). Where WT amplitudes declined, responses in young GKI slices increased such that there was significantly more dopamine released (Figure 3A.ii). Conversely, in slices from aged mice, neither genotype exhibited a relative increase or decrease in dopamine release over the same timeframe (Figure 3A.ii; 2-way RM-ANOVA; F(1,61)=0.65, p=0.4). The data suggest that the GKI mutation results in alterations to the regulation of dopamine release in young animals, rather than disturbing the mechanics of single stimuli-evoked release. Furthermore, this alteration is no longer present at 12 months. Increased nigrostriatal dopamine transmission in young GKI slices is lost with age, whereas early increases in dopamine extracellular lifetime are maintained in old GKI slices, and matched by age-related increases in WT slices. Fast-scan cyclic voltammetry (FSCV) was conducted in the dorsolateral striatum of acute slices prepared from WT and GKI mice. (A) Dopamine release and reuptake transients were evoked by single or paired (4 s IPI) local stimuli (i). There was no significant genotype effect (see text) on peak dopamine release over a range of stimulus intensities in slices from 3 month or > 12 month old mice (ii). Upon repeated stimulation, there were significant (post-test *p=0.05, **p=0.01), elevations in dopamine peak release in GKI mice, relative to WT controls at 3 months (ii). In WT and GKI slices from > 12 month mice, peak dopamine release was more variable, there was no modulation induced by repeated stimulation, as in younger slices, nor were there genotype differences. There was a significant age-dependent increase in D2 autoreceptor mediated paired-pulse depression (iii; 3 month n = 20(5) and 13(5),>12 month n = 18(6) and 30(11) for WT and GKI, respectively, post-test ***p=0.001), reflected by reduced paired-pule ratios (PPR), but there was no main effect of genotype (p=0.7) or genotype-age interaction (p=0.99). (B) The D2 agonist quinpirole (10 uM) equally suppressed peak evoked dopamine release in WT and GKI slices from 3 month mice after a 10 min wash-in; however, continued exposure revealed a trend toward a main effect of genotype (p=0.07) on repeated release, and a significant genotype-time interaction (p=0.039, post-test *p=0.049 at 18 min post application). This effect was not observed in > 12 month slices (i). Evoked dopamine transient decay time revealed a significant main genotype effect (ii. No drug, 3 month n = 20(5) and 13(5),>12 month n = 19(6) and 33(11) for WT and GKI, respectively p=0.0025) due to significantly longer decay times (slower transients) in 3 month GKI slices (post-test *p=0.027). In > 12 month slices, WT decay times had increased to a value similar to 3 month GKI (ii. No drug). The presence of the presynaptic dopamine transporter (DAT) blocker GBR (10 uM, ii. + GBR12909) increased all transient decay times, as expected. There were significant main effects of age and genotype (3 month n = 17(6) and 23(8),>12 month n = 31(9) and 30(11), p=0.0002 and 0.0043 for WT and GKI, respectively) upon transient lifetime; in the absence of dopamine re-uptake, 3 GKI transients were still significantly slower than WT controls (post-test *p=0.014), and significant age-dependent increases in dopamine decay times were observed in WT slices (post-test *p=0.0024). In slice experiments, striatal dopamine release is curtailed over short time periods (<5 s) by D2 autoreceptors on nigral terminals (Phillips et al., 2002; Rice et al., 2011), evident as paired-pulse depression. Paired-pulses (Figure 3A.i and iii) evoked predicted depression of the second pulse in WT and GKI slices from young (~70%) and aged animals (~80%); there was a significant effect of age, but not genotype on paired-pulse ratios (Figure 3A.iii. 2-way ANOVA; F(1,77)=37.9, 0.142 p=0.0001 and 0.7, respectively; post-test 3 month vs. > 12 month p=0.0002 and 0.0002 for WT and GKI, respectively). The data demonstrate that D2 autoreceptor signaling and short-term negative regulation of dopamine release is not altered by the GKI mutation. To investigate chronic D2 activation, we bath applied a low concentration of the D2 agonist quinpirole (50 nM, Figure 3B.i). In the initial presence of quinpirole (0 min; 10 min after switching perfusate), response peaks of slices from mice aged 3 months were reduced by ~20% in both genotypes. However, upon continued stimulation in the presence of quinpirole, the depressive effect became more pronounced in GKI than WT slices as highlighted by a significant interaction between genotype and time (Figure 3B.i. 2-way RM-ANOVA; F(4,108)=2.6, p=0.039). By 18 min post-application, WT values were reduced to 64.7 ± 5.4%, whereas GKI were significantly more sensitive, being reduced to 46.75 ± 3.29% (post-test p=0.049). In slices prepared from mice aged >12 months, no such genotype interaction was observed (Figure 3B.i). The data demonstrate that early hypersensitivity of dopamine release to chronic D2 activation in GKI slices is not present in slices from older animals. Striatal dopamine transmission is tightly regulated by dopamine transporter (DAT)-mediated reuptake; DAT levels, location and activity dictate the sphere of influence and, dominating over diffusion, are the major determinant of released dopamine’s extracellular lifetime in the striatum (Rice et al., 2011; Jones et al., 1998; Gainetdinov, 2008). There was a significant main effect of genotype (Figure 3B.ii. No Drug; 2-way ANOVA; F(1,81)=9.73, p=0.003) upon single response decay times (Tau); decays were significantly slower in slices from GKI mice aged 3 months than WT controls (post-test p=0.01), but similar in older slices. Slower DA transients might be expected to result from reduced DAT levels or activity, but we found no genotype, age or interaction effects upon DAT (or TH) staining (Figure 3—figure supplement 1A. ANOVA values included). To further probe DAT we also biochemically assessed protein levels and found a significant main effect of genotype, due to increased levels DAT protein (relative to GAPDH) in the brains of GKI mice (Figure 3—figure supplement 1B. ANOVA values included). Although increased levels of DAT protein suggests slower transients are not due to a paucity of DAT, it is possible that slowing of DA transients in GKI mice is due to a functional impairment in DAT clearance after release. Therefore, in a separate set of experiments we evoked release in a high concentration of the DAT blocker GBR12909 (1 uM, IC50 = 6.63 nM; Figure 3B.ii). In the absence of DAT re-uptake, as expected, WT decays were approximately twice as long (No Drug 442.1 ± 38.9 ms,+GBR12909 788.2±ms); however, there remained significant main genotype and age effects (Figure 3B.ii +GBR12909; 2-way ANOVA; F(1,97)=8.55 and 15.35, p=0.004 and 0.0002, respectively). Consistent with results in the presence of DAT reuptake, decays were significantly longer in slices from GKI mice than WT controls aged 3 months when DAT was blocked (post-test p=0.014). Decays in WT animals slowed with age (post-test p=0.002) to an extent similar to both young and old GKI decay times. The data demonstrate augmented dopamine transmission in young GKI mice, revealed by repeated stimuli and extracellular lifetime of individual pulses, which is not due to a deficit in DAT-dependent clearance. Moreover, an age-dependent increase in stimulated striatal dopamine signalling (increased extracellular lifetime) appears to occur in GKI mice at an earlier time point. As stimulated release is not impaired in older GKI slices, we conclude that the latent reduction in extracellular dopamine levels observed at 12 (but not 6) months by microdialysis (Yue et al., 2015) is a result of changes to the endogenous regulation of nigrostriatal dopamine release, rather than impaired vesicular release per se. Interestingly, in agreement with our data here, another recent report in similar knock-in mice by Longo and colleagues (Longo et al., 2017) found that DAT levels and activity are increased in GKI brains from animals aged 12 (but not 3) months. In this light, synaptic DA release seen here may appear similar to WT in aged GKI slices (or even reduced by microdialysis [Yue et al., 2015]) due to increased clearance through DAT, masking a persisting increase in DA release. Familial and idiopathic PD are now accepted as complex motor and non-motor syndromes resulting from dysfunction to multiple neurotransmitter systems and cell types throughout the peripheral and central nervous system (Volta et al., 2015a; Kalia and Lang, 2015). Although some treatments are effective for motor dysfunction, none slow or prevent the neurodegenerative process. Many non-motor symptoms antedate motor manifestations (and clinical diagnosis) by years to decades; demonstrating protracted pathological processes. In this light, investigations of PD etiology in model systems, especially short-lived rodents, should expect initially subtle, potentially progressive, dysfunction of multiple neuronal systems, prior to (or without) overt motor dysfunction and cell loss (Volta et al., 2015a; Kalia and Lang, 2015). GKI mice harbor a single point mutation, which confers the greatest genetic risk for PD in humans. We find that spontaneous exploration is significantly elevated in certain tasks in young mice, in broad agreement with work by other labs in similar animals (Longo et al., 2014). This exploratory hyperactivity is seemingly context dependent, observed in cylinder exploration but not evident in the open field; as such we predict this reflects changes in motivation, rather than motor function per se. We expect ongoing investigations of these animals in more complex environments and tasks will uncover other phenotypes. We previously observed that presynaptic glutamatergic release is elevated in cortical cultures from GKI mice (Beccano-Kelly et al., 2014), suggesting altered synapse development and/or mature function. Here we find that similar increases are observed in glutamate release onto striatal neurons in brain slices from young GKI animals, without changes in synapse number. This increase is not preserved as animals age, with GKI mice exhibiting a pronounced down-regulation of spontaneous glutamate release. A recent independent study of similar GKI animals drew similar conclusions (Matikainen-Ankney et al., 2016), and the weight of evidence demonstrates early alterations to synaptic function produced by endogenous G2019S mutations. Our previous study revealed reduced extracellular dopamine levels in the striata of aged (12 months), but not young (6 month) GKI mice (Yue et al., 2015). Our analyses of dopamine transmission here demonstrates that reductions in vivo are unlikely to be due to impaired release or DAT reuptake, and are likely a consequence of altered regulation of dopamine release and/or nigral burst firing patterns in vivo. In young GKI mouse slices, dopamine release was elevated upon repeated stimulation, and the extracellular lifetime of dopamine was consistently augmented. This suggests that, similar to glutamate synapses, dopamine transmission is elevated in young animals by the G2019S mutation, an elevation which is lost with ageing. Recent brain imaging studies demonstrate that clinically manifest LRRK2 mutation carriers develop deterioration of the dopamine and serotonin systems, similarly to sporadic PD patients (Sossi et al., 2010; Wile et al., 2017); however, non-manifest mutation carriers exhibit increased striatal dopamine turnover (Sossi et al., 2010) and early increases in serotonin transporter binding (Wile et al., 2017). We conclude that the GKI mouse is a valuable model in which to probe the etiology and early pathophysiology of LRRK2, and potentially sporadic, parkinsonism. Interventions against such pathophysiological processes in these models may provide the functional neuroprotection, so desperately lacking for Parkinson’s disease and related disorders. C57Bl/6J wild-type (WT) and Lrrk2 G2019S knock-in heterozygous (GKI) mice (Yue et al., 2015; Beccano-Kelly et al., 2014) were maintained according to the Canadian Council on Animal Care regulations. To avoid confounds of oestrus cycle upon behavior and neural connectivity, only male animals were used in this work. Mice undergoing surgery were weighed at the age of use, and all other mice in the colony were weighed at a single time point to produce an age vs. weight plot. Separate cohorts of adult animals were tested (once only) at 1–6 and 12–18 months of age. After familiarization to handling over three days with the operator, mice underwent the following behavioral paradigms and videos were analyzed post-hoc using ANY-maze (Stoelting) behavioral tracking software, as previously (Beccano-Kelly et al., 2015; Volta et al., 2015b). Open field (OF) test: mice explored an arena (48 cm x 48 cm) for 15 min. Cylinder test: mice were placed in a 1 l beaker and video recorded for 5 min. The number of rearings and forelimb wall contacts were scored manually off-line. All testing and analysis was performed experimenter blind. Whole-cell patch clamp recording was conducted in striatal projection neurons (SPNs) in 300 μm thick coronal slices from 1 to 18 month-old male mice, as in (Beccano-Kelly et al., 2015; Milnerwood et al., 2010). To help preserve cell viability, slices from > 12 month old animals were pre-incubated in recovery solution containing (in mM: 93 NMDG, 93 HCl, 2.5 KCl, 1.2 NaH2PO4, 30 NaHCO3, 20 HEPES, 25 Glucose, 5 Sodium Ascorbate, 2 Thiourea, 3 Sodium Pyruvate, 10 MgSO4.7H2O, 0.5 CaCl2.2H2O, pH 7.3–7.4, 300–310 mOsm) for 15 min at 34˚C prior to transfer to a holding chamber. Slices were held and perfused at RT with artificial cerebrospinal fluid (ACSF) containing (in mM): 125 NaCl, 2.5 KCl, 25 NaHCO3, 1.25 NaH2PO4, 2 MgCl2, 2 CaCl2, 10 glucose, pH 7.3–7.4, 300–310 mOsm). Cells were visualized by IR-DIC on an Olympus BX51 microscope (20x + 4 x magnifier) and SPNs visually identified by somatic size (8–20 μm), morphology and location within the dorsolateral striatum, 50–150 μm beneath the slice surface. Data were acquired by Multiclamp 700B amplifier digitized at 10 kHz, filtered at 2 kHz and analyzed in Clampfit10 (Molecular Devices). Pipette resistance (Rp) was 5–8 MΩ when filled with (in mM): 130 Cs methanesulfonate, 5 CsCl, 4 NaCl, 1 MgCl2, 5 EGTA, 10 HEPES, 5 QX-314, 0.5 GTP, 10 Na2-phosphocreatine, and 5 MgATP, 0.1 spermine, pH 7.2, 290 mOsm. Tolerance for series resistance (Rs) was < 25 MΩ and uncompensated; ΔRs tolerance was < 10%. Events were analyzed blind using Clampfit10 (threshold 5 pA), and checked by eye so only monophasic events were included for amplitude and decay kinetics, whereas all others were suppressed but included in frequency counts. eEPSCs were evoked by 40μs pulses ranging in intensity between 20-550μA delivered through a glass recording micropipette placed 200–250 μm dorsal of the recording site. Stimulus intensities were set to produce ~60–70% max amplitude response for paired-pulses (20–140 ms inter-pulse intervals) and AMPA:NMDA eEPSCs (AMPA-mediated at Vh −70 mV, NMDAR-mediated Vh + 40 mV, 40 ms delay). Responses were evoked at 0.066 Hz. Data are presented as mean ± SEM where n is cells from a minimum of 3 animals (animal n in brackets). Quinpirole ((-)-quinpirole hydrochloride, 10 uM) and remoxipride ((S)-(-)−3-Bromo-N-[(1-ethyl-2-pyrrolidinylmethyl]2,6-dimethoxybenzamide hydrochloride, 10 uM), purchased from Tocris Biosciences, and tetrodotoxin (TTX; 1 uM, Alomone Labs) were bath applied in the perfusate. To investigate potential cell-specific effects, a subset of GKI mice were crossed with Drd1a-(td) tomato mice (Jax: B6.Cg-Tg(Drd1a-tdTomato)6Calak/J) (Ade et al., 2011) to target visually identified D1R (+ve) and D2R (-ve) expressing SPNs; cells were also filled with either biocytin (~0.1%) or Lucifer yellow (~0.02%) in the internal solution and post hoc immunohistochemically stained for substance-P to further identify D1R-expressing or D2R-expressing SPNs (described below). 300 um coronal sections were prepared as above, allowed to recover for ≥1 hr, then single sections transferred to the recording chamber (23–25°C). Stimuli were delivered by nickel-chromium wire bipolar electrodes (made in house) placed in the dorsolateral striatum, optically isolated (A365, World Precision Instruments, FL, USA) and controlled/sequenced with ClampEx software. Flow rate was 1–2 ml/min. Voltammetric responses were recorded, standardized and analyzed with an Invilog In Vivo Voltammetry system and software components (Invilog Research Ltd., Kuopio, Finland). Carbon fiber electrodes (diameter: 32 μm, length: 30 μm, sensitivity: 21-40nA/μM) were purchased prefabricated by Invilog and placed within 100–200 um of the stimulator. Triangular waveforms (ramp from −400 mV to 1200 mV to −400 mV, 10 ms duration at 10 Hz) were used to detect the oxidation and redox peak for DA between 700 and 800 mV (at 3.2 and 3.5 ms). Input/Output paradigm consisted of increasingly intense single pulse stimuli (100-700 μA, delivered every 2 minutes / 0.01 Hz) to determine ~70% of the maximum response used for the rest of the experiment. Five single pulses were delivered at 0.01 Hz to assess baseline stability, followed by a single paired-pulse stimulus (4 s IPI). During drug wash in, single pulse stimulations were continued at 0.01 Hz for ten minutes. A repeat of the five single simulations and paired-pulses were then recorded in the drug condition. At the end of each day, a three-point calibration of each carbon fiber electrode was conducted (final concentrations 0 μM, 0.5 μM, 1.0 μM DA in ACSF). All drugs were bath applied in the perfusate; quinpirole ((-)-quinpirole hydrochloride, Tocris Biosciences, Bristol, UK, 50 nM, previously assayed to reduce control dopamine transients by < 50%) and GBR-12909 (1-[2-[Bis-(4-fluorophenyl)methoxy]-ethyl]−4-[3-phenylpropyl]piperazine dihydrochloride; Tocris Biosciences, 1 μM) were employed to assay presynaptic D2R agonism and DAT-dependent DA reuptake, respectively. For subsequent experiments after GBR was applied, to avoid potential confounds of residual GBR in the perfusate, data were not used for measurement of basal response peak amplitudes, paired pulses or response decay kinetics. For a subset of whole-cell recordings, intracellular solution contained biocytin (~0.1%) or Lucifer yellow (~0.02%). Slices containing filled cells were fixed (4% paraformaldehyde in 4% sucrose PBS, 4°C overnight), as previously (Beccano-Kelly et al., 2015), washed (PBS), permeabilized (0.3% H2O2 in 100% methanol 30 min), rinsed (3x PBST, 0.1%) and blocked (3% non-fat milk and 10% NGS for 1 hr) prior to incubation with anti-Substance P (SP) antibody (24 hr 4°C, AB1566; Millipore; 1:100), then Alexafluor-488 secondary antibody (2 hr RT Lifetech; 1:200) and Cy3-conjugated streptavidin (for biocytin filled sections) prior to slide mounting. Sections were imaged by confocal laser-scanning microscopy (Olympus Fluoview FV1000). Mean somatic intensity of SP immunolabeling was measured from flattened images produced by z-stack max projections of ~6 (1um z-step) sections containing the cell body (~5–7 microns of tissue depth). Intensity measures (488 nm) were produced using somatic ROIs constructed with Cy3 or Lucifer yellow channel and normalized to the surrounding neuropil in ImageJ 1.44 p software (NIH, USA). Cells with normalized fluorescence intensity >1.5 x neuropil staining (a level apparent in ~50% of all unfilled cells) were scored as SP + ve and thus D1 +ve. For tissue analysis 2–3 and 12 month-old mice were terminally anesthetized (sodium penthobarbital 240 mg/Kg, i.p.) and perfused with 4% paraformaldehyde (PFA). Brains were removed, post-fixed (4% PFA 4°C) overnight then cryoprotected with sucrose. Coronal slices (30 µm) were obtained by cryostat and treated the next day with 10 mM sodium-citrated plus 0.05% Tween (30 min, 37°C). Sections were rinsed with 0.1% PBST (3 × 10 min), blocked in 3% milk in 0.03% PBST (30 min, RT) followed by a second block in 10% NGS in 0.03% PBST (30 min, RT). Primary polyclonal rabbit anti-VGluT1 (135302 Synaptic Systems; 1:1000), guinea pig anti-VGluT2 (AB2251 Millipore; 1:2500), chicken Tyrosine Hydroxylase (ab76442; Abcam; 1:1000) and affinity isolated rabbit anti-Dopamine Transporter (N-terminal, D6944 Sigma; 1:1000) antibodies were applied (5% NGS + 0.01% NaN3 in PBST; overnight 4°C) prior to washing (3 × 10 min PBST) and secondary incubation with goat Alexafluor-488 anti-rabbit, Alexafluor-633 anti-guinea pig, Alexafluor-488 anti-chicken and Alexafluor-568 anti-rabbit IgG secondary antibodies (90 min RT, Invitrogen; 1:1000), washed (PBST 3 × 10 min) and mounted with DAPI Fluoromount-G (Catalog: 0100–20; SouthernBiotech). Images were acquired at 20x magnification on an Olympus Fluoview FV-1000 confocal laser scanning microscope. For glutamatergic synapse stains (VGluT1 and VGluT2), 60x magnification z-sections (0.33 µm/slice) were flattened into five stack max projections and binarized to create puncta masks. Analysis of puncta area, integral intensity, density and colocalization were conducted using CellProfiler (pipelines available on request). For DAT and TH staining, fluorescent intensity measurements of the striatum and cortex were averaged for each section from five ROIs placed on 20X z-projected image stacks (1.0 µm/slice) using ImageJ software (NIH, USA). Background fluorescence intensities were subtracted from 5 ROIs acquired in the corpus callosum. Animals were perfused with PBS, the brain removed and Golgi impregnated following manufacturer’s instructions (FD NeuroTechnologies - Rapid GolgiStain Kit). SPNs in the dorsolateral striatum were identified in 150 μm coronal vibratome sections and imaged by light microscopy (10 and 40X, Zeiss Axio Observer.z1). 0.5 μm z-stacks were used to quantify dendritic protrusions in 3 x ~30 μm segments of tertiary and quaternary dendrites per cell (averages conducted per cell,~6 cells per animal) in imageJ, as in (Milnerwood et al., 2013; Petkau et al., 2012). Data are presented throughout as mean ± SEM where n is the number of animals, or else cells (electrophysiology)/brain slices (voltammetry/VGluT staining) from the number of mice indicated in parentheses. In Figure 2—figure supplements 3, 6 and 7, t-test refers to an unpaired parametric Students’ t-test. Multiple comparisons were conducted throughout by 2-way ANOVA or RM-ANOVA as indicated, and Holm-Sidak multiple comparison post-hoc tests were performed using Prism 6.0 (GraphPad, San Diego California USA). Frontiers in Systems Neuroscience 5:32. The Journal of Physiology 580:225–240. Frontiers in Cellular Neuroscience, 8, 10.3389/fncel.2014.00301, 25309331. Journal of the International Neuropsychological Society 19:695–708. European Journal of Neuroscience 27:671–682. Naunyn-Schmiedeberg's Archives of Pharmacology 377:301–313. J Gregory, editors. Molecular probes Inc.
Journal of Parkinson's disease 3:1–11. The American Journal of Human Genetics 76:672–680. The Journal of Physiology 585:817–831. New England Journal of Medicine 354:424–425. Parkinsonism & Related Disorders 13:S2–S7. Parkinsonism & Related Disorders 21:1170–1176. Parkinsonism & Related Disorders 21:1156–1163. The American Journal of Managed Care 14:S49–58. The American Journal of Managed Care 14:S59–69. The American Journal of Managed Care 14:S40–48. Thank you for submitting your work entitled "Progressive behavioral and synaptic phenotypes in LRRK2 G2019S knock-in mice" for consideration by eLife. Your article has been evaluated by a Senior Editor and four reviewers, one of whom, Dr. Andrew West, is a member of our Board of Reviewing Editors. The three peer reviewers have opted to remain anonymous. Our decision has been reached after consultation between the reviewers and editors that all agree on the recommendation. All reviewers thought there were many strong and exciting points to the work. The construct validity is particularly impressive, as was the analysis at multiple time points. However, as explained below, all reviewers raised issues revolving around three main points. Unfortunately the nature and severity of the points raised does not align to a reasonable path for acceptance of your work at eLife in the short-term, and should therefore lead to a rejection notice so that the work would not be further delayed. 1) There are major problems with the statistics employed. All reviewers noted the appearance of arbitrarily conceived tests and group comparisons. In many cases the type of test being used did not seem justified, for example a post-hoc test within the context of a non-significant ANOVA, and the tendency to interpret a non-significant result as a trend. Because a thorough re-evaluation of the tests being used may dramatically alter the conclusions that would be drawn in a revision, this is the central problem that should preclude further consideration. eLife weighs very seriously concerns about statistics. 2) The behavior analyses are needed to support the conclusions but reviewers felt the data that were included were insufficient and may be over-interpreted to fit into the model, and substantial new experiments would be needed to convince the field of this aspect of the study. 3) The last point is that reviewers objected to the muddled style of the manuscript, where novel and confirmatory points are blended together in a broad-stroke tendency to over-generalize the results in a way reminiscent of an opinion piece or editorial. All reviewers felt the arguments made were thought provoking and well-conceived, but out of place in this context. With broad arguments made but little data to convincingly support them, especially in the electrophysiology, this opens the door for the need for a slew of new experimental approaches that are needed in order for the conclusions to be supported in a way that convinces the reviewers. The manuscript by Volta et al. describes a follow-up to their original characterization of the LRRK2 G2019S knockin (GKI) mouse model of Huntington's disease (HD). The authors use an array of behavioral, electrophysiological, electrochemical and anatomical approaches to characterize young (1-3 month old) and middle-aged (12 month old) mice. The approaches are all ones with which the authors have demonstrated expertise. The authors conclude that there is an age-dependent effect of the LRRK2 mutation. In young mice, it leads to hyperactivity and increased striatal glutamatergic and dopaminergic transmission. In the older mice, these effects reverse. However, the data doesn't provide convincing support for either set of conclusions (as stated). There are other concerns. The most robust behavioral effect is the reduction in open field and rearing behavior in the older GKI mice. The conclusion that the behavioral effects in the GKI mice are 'biphasic' rests up a modest increase in rearing in the cylinder test in young GKI mice. This modest effect could have several causes and might not be related to 'increased exploratory drive' or dopamine at all. The analysis of presynaptic glutamatergic function is muddled. Moreover, the data do not support the conclusion that release probability is elevated at glutamatergic synapses on SPNs in young GKI mice. First, spontaneous EPSC frequency in ex vivo brain slices is complicated by a range of factors, including slice angle, which limits its information value. Second, the absence of an alteration in evoked PPR in the GKI mice argues that there is not a change in release probability, assuming that electrical stimulation and sEPSCs are giving a picture of the same synapses. As a consequence, the conclusion that glutamatergic synaptic transmission is enhanced in young GKI mice is not justified. The slowing of the sEPSCs with age in the GKI SPNs is one of the cleanest pieces of data in the paper (Figure 2B). But why is there the change? If this is dependent upon presynaptic spiking and not upon release probability (no change in PPR or apparent synapse density), it becomes very difficult to interpret. 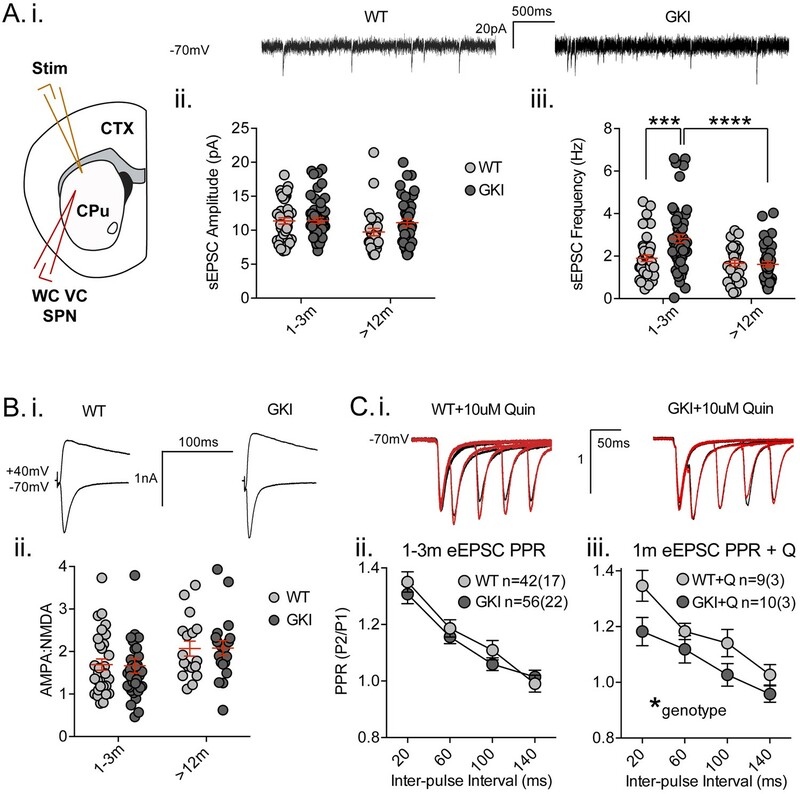 Although interesting, the effects of quinpirole are very difficult to interpret because there are D2Rs not just at presynaptic sites but postsynaptic ones as well, opening the door to all sorts of indirect neuromodulatory effects (glutamatergic terminals have a wide range of GPCRs capable of altering release). Were the effects of quinpirole on evoked glutamate release dependent upon SPN subtype? What effect did a D2R antagonist have on evoked properties? It is also worth noting that these experiments are complicated by the use of intrastriatal stimulation (which activates a wide range of chemically distinct axons). Either cortical stimulation in parasagittal slices or optogenetic activation of cortical axons would have simplified this analysis. The proposition that DA release increased in GKI striata with low frequency stimulation because of 'altered vesicle cycling and availability' is interesting but without any experimental support. This is an interesting and well-crafted study examining the age-dependent effects of the LRRK2 G2019S mutation in mice on motor behavior and medium spiny neuron activity. The strengths of the study sit with the longitudinal analysis of the mice, the identification of mutation and age-dependent cellular and behavioral phenotypes and with the characterization of changes in dopamine availability. These strengths are diluted by the failure to test the mechanism analyzed (DA availability) as a source of the changes in behavior or glutamatergic activity. Novel and confirmatory results are presented in a way that is unnecessarily confusing and some of the statistics used are inappropriate. 1) The data show the LRRK2 G2019S point mutation can affect motor behavior in a cylinder and spontaneous EPSCs in SPNs (Figures 1, 2). Subsequent data (Figure 2, 4, 5) support that there are genotype dependent differences in dopamine "tone" in the dorsal striatum. Since the dopamine alterations reported could cause the altered motor behavior and influence cellular behavior, it is not clear why this mechanism was not tested directly at any age. Additionally, would LRRK2 kinase inhibitors be anticipated to "normalize" behavior and activity in GKI mice? 2) Data presentation gives equal space to novel and confirmatory findings. This is confusing and detracts from what is novel. Confirmatory findings should be presented more briefly and used to establish rationale and/or demonstrate reproducibility. Novel data require more thorough analyses. For example novel longitudinal studies should be presented in a manner that permits direct comparison between genotypes and ages. Data shown in Figure 1Ci, ii; 1Di, ii repeat published experiments by the same group. These data and new experiments (1Bi, ii) are each subjected to separate, pairwise comparisons. Aside from being statistically weak, this presentation style fails to fully assess effects of age and genotype (using something like a two-way ANOVA). Figure 4Aii and iii should also be reconfigured along these lines. Such direct comparisons would be more robust, feature what is novel, and could reveal new information. 3) Performance in the cylinder test is broadly interpreted as hyper- or hypoactivity. This is not a typical interpretation of this test. Differences in rearings alone are insufficient to conclude the mice are hyperactive in their youth and hypoactive in old age and this oversimplification needs to be reined in. (The slight decrease in "exploration" at 12 months in KI mice could support hypoactivity, but contradiction with previous work from this lab and others suggests that at best, this effect is weak). However, since rearing number reveals a genotype-dependent difference in young and old animals, the video data could (and should) be further analyzed. In addition to numbers of rearings, does duration change? Was there any evidence of forepaw dyskinesia (since forelimb wall contacts were measured)? Citation/s should also be provided for the method. 4) The idea that the G2019S mutation may be conferring early synaptic senescence is intriguing (Abstract, Discussion), but not well supported by the data. Changes observed in older WT neurons could reflect aging, but they do not occur earlier in GKI neurons (normal aging in both? ); other changes in GKI neurons are not matched by WT neurons (GKI pathology?). The statement that the mouse model "recapitulates data from LRRK2 carriers" (Abstract) is a stretch. 5) Direct comparisons between two data sets using t-test (i.e. # and ## in Figure 2Aii, iii) that are part of another analysis (ANOVA with a post test) are not appropriate (subsection “Striatal glutamate transmission”, second paragraph; also Figure 4, Figure 5ii). If ANOVA shows no difference then a posthoc test cannot be used. Sample variance should also be taken into account and F-stats are needed. The same data is presented twice in Figure 2Cii, and then again in iii. If this is intentional, then proper statistical analysis should be done, comparing all three groups (WT+Q, GKI+Q, WT-Q), and groups should be shown on the same set of axes. Statistical test used for Figure 1A is not provided. 6) Changes in PPR support alterations in presynaptic terminal function, but are insufficient to conclude altered release probability as suggested. 7) Introduction and Discussion are overly long and there is a tendency to over-generalize. For example, "mediated by a multiplicity of interactions with Rab-family GTPases", has not yet been tested for the functions outlined, and "a progressive, biphasic, phenotype in GKI mice, reminiscent of that observed in heterozygous human carriers. "-How are any of the phenotypes described progressive and what biphasic phenotype is being referred to in humans? 7) Why were electrophysiological recordings and FSCV conducted at RT? Temperature has effects on the measures recorded. 8) Figure 3 does not add to what has been published by this group and others and could be deleted. 9) There are also some errors in the Materials and methods describing LY fills and immunohistochemistry (LY and 488?). Where does Cy5 filling come from and what is examined in the Cy3 channel? Raster scanned image stacks are generally unreliable for intensity measures (Figure 5) – why not use a western blot for DAT (previous work in the lab shows TH is unchanged)? 10) Example traces should be added to Figure 1A for the 12 or 18 month data where genotype-dependent changes in EPSC frequencies are observed. Generally, I think the subject matter – modeling early, pre-degenerative changes in synaptic function in PD models is important and of brand interest. I think the authors have been very thorough in their approach. My concerns are mainly with the range of statistical analyses employed that appear rather random in places, and that some of the conclusions may be lacking a solid data-based foundation. Figure 1: why is the n for the rearing experiments much smaller than the other 2 behavioral measures? Were they conducted in independent groups of animals? Or were outliers removed? Subsection “Striatal glutamate transmission”, second paragraph: are the quoted ANOVA significance levels (0.001) referring to the interaction of age and genotype for both measures? Subsection “Striatal glutamate transmission”, second paragraph: why Bonferroni for one comparison and Dunn for another? And Mann Whitney for another? Figure 4: why are DA levels normalized to WT (presumably normalized to the average of the WT data)? Raw data not significant? (Not done for DOPAC+HVA:DA ratio). Figure 4 and subsection “Striatal dopamine levels and release”, first paragraph: trend towards "altered" DA turnover (p=0.33) is barely a trend. The microdialysis data might have been more informative had they conducted no-net-flux analysis to gain insight into DA clearance and provide comparison with the FSCV data. Figure 4Biii and 5Aii and in associated text: what are the numbers in parentheses? Is this the number of animals? And the former number of stimulations? Is this legitimate? Further explanation of the factor "tau" would be helpful. Unclear to me why the authors conclude increased release is the cause of the longer decay times in evoked transients in the mutant when the amplitude of these transients is not increased. (Although the amplitudes of the specific transients from which tau was calculated are not given and perhaps should be). I understand the fact that the difference in tau persists in the presence of the uptake blocker argues against impaired uptake being a factor (although I think this might be better explained), but perhaps differences in other forms of clearance (diffusion/extracellular volume fraction/tortuosity?) should be considered/discussed ahead of concluding it is facilitated release/recycling. Having said that, the rise in transient amplitudes with repeated stimulations over time at low frequency is perhaps one of the most robust findings of the manuscript. I'm also not sure the DAT immunofluorescence is a sufficiently sensitive measure of membrane-associated DAT, but kudos to them for considering "altered" expression as an explanation for reduced effectiveness of the uptake inhibitor. (But again, the rationale could be better explained). To further conclude that the changes are due to vesicular recycling may be considered a bit of a stretch based on these data alone, it seems to me, although of course there are plenty of other reasons to think this is likely. Thank you for submitting your article "Age-related decline of behavioral alterations, glutamate and dopamine neurotransmission in LRRK2 G2019S knock-in mice" for consideration by eLife. Your article has been favorably evaluated by a Senior Editor and four reviewers, one of whom, Andrew West, is a member of our Board of Reviewing Editors. The reviewers have discussed the issues with one another and the Reviewing Editor has drafted this decision to help you prepare a revised submission. The principle finding of the manuscript is that young mice have elevated striatal glutamate and dopamine release and show increased dopamine extracellular lifetime compared to WT littermate control mice. Background literature surrounding LRRK2 would support that some of these outcomes would be related to increased LRRK2 activity due to enhanced levels of LRRK2 and/or enhanced kinase activity. The high frequency of the mutation in PD makes these first reports of this novel model (freely available commercially) of high interest. However, the report is largely descriptive with few new mechanisms proposed, and the report is very short on behavioral outcomes. For further consideration, all reviewers felt that the interpretation that increased sEPSCs (in this study) are due to increased mEPSCs should be tested directly by recording in the presence of TTX. Just as important, a D2R antagonist should be applied to attempt to ameliorate the knock-in effects. These experiments in the 'young' mice will be required to bolster the impact to a minimum level for further consideration. 1) For all voltammetry slice experiments, how many slices from how many animals for each group needs to be made clearer in the legend of Figure 3. The reviewers are assuming a well-powered experiment. If the data points (and stats) are number of slices from a much smaller number of animals, this would be unconventional in the voltammetry literature. 2) Representative western blots should be presented for all analyses (e.g., western blots for DAT), and all densitometry data (LiCOR, etc.) should be included as a supplementary excel file that shows individual calls. For example, readers could then be able to tell, for example, whether there might be GADPH differences, and how good of a 'housekeeper' the protein is, based on the non-normalized data which at the moment is hidden. 3) The term "age-related decline" and similar phrases used show bias in the outcomes compared to more neutral terms like "normalize" that should be considered. 4) The text still rambles in the introduction, for example the discussion of non-motor symptoms in PD. Focusing in on the GS mutation and past e-phys studies may be more useful to readers. The authors may need additional assistance from others to improve readability and the storyline in stitching together the three seemingly disparate main datasets together in a more convincing way. 5) Data shown in Figure 2—figure supplement 2 suggests that the < 6 month group was < 3 month for this dataset. If true, the narrower range should be reported, as the changes reported may not be sustained at 6 months. Regarding the statistics, this is only a matter of presentation, and there were no arbitrary selections. Specifically, non-parametric tests were chosen based on statistical testing of normal distribution (explained in Materials and methods), and the only reason we separated the behaviour by age was to highlight that it was not the same animals over time, obviously that is the case for the terminal experiments, so we didn't. We have simplified the presentation and analyses to 2-way ANOVA throughout, with HolmSidak post-test. While many (legitimately analysed) statistically significant differences may be masked by limiting analyses to one post-test throughout, in many cases this maintains the same statistical significance pattern. Thus for clarity we have blanket analysed all data. At no point was a direct comparison reported on grouped data with a failed (p>0.05) ANOVA, merely as a less stringent post-test on a successful ANOVA (which was clearly explained). I urge the editors and reviewers to note that p-values estimate how unlikely it is that data sets are different by chance alone (depending on how the p value is generated, i.e., which post-test is used and its alpha adjustment), not whether or not they are ‘really different’. We have similarly simplified the presentation and discussion of the behavioural results. We feel that what has been referred to as confirmatory points are in several places important controls. Other than the microdialysis (which we have removed as previously published in data from the founding colony), we have presented many of these data here as supplemental. The arguments regarding what the data might mean (which I would call discussion, not conclusions) have been removed or, we hope, more explicitly discursive than conclusive. The manuscript by Volta et al. describes a follow-up to their original characterization of the LRRK2 G2019S knockin (GKI) mouse model of Huntington's disease (HD). The G2019S mutation is liked to Parkinson’s disease, not Huntington’s disease. We assume this is just an elaborate typo and request that the reviewer be more careful in future appraisals. The authors use an array of behavioral, electrophysiological, electrochemical and anatomical approaches to characterize young (1-3 month old) and middle-aged (12 month old) mice. The approaches are all ones with which the authors have demonstrated expertise. The authors conclude that there is an age-dependent effect of the LRRK2 mutation. In young mice, it leads to hyperactivity and increased striatal glutamatergic and dopaminergic transmission. In the older mice, these effects reverse. However, the data doesn't provide convincing support for either set of conclusions (as stated). For clarity, and at the reviewer’s suggestion, we have presented the data throughout as ‘young’ and ‘aged’, to match other data sets within the manuscript, and justified this with regards to our previous study in the text. We have toned-down the argument and discussion of the implications but maintain that the data forces a conclusion that [the mutation]: “In young mice, it leads to hyperactivity and increased striatal glutamatergic and dopaminergic transmission”. It would appear that older animals did/do not have robust exploratory differences; in the current manuscript we do not discuss a reversal of phenotype, but age-dependent changes. There are other concerns. The most robust behavioral effect is the reduction in open field and rearing behavior in the older GKI mice. The conclusion that the behavioral effects in the GKI mice are 'biphasic' rests up a modest increase in rearing in the cylinder test in young GKI mice. There was no statistical evidence that the later-aged observations in open field and rearing were the most robust finding in the previous document (far from it); to be frank, a n of 9-12 is low for behavioural observations. Thanks to the reviewers, and revision process, we have had the opportunity to increase observations of 12+ month-of-age animals, as presented in this short report. Having increased our observations and power, the reduction in open field exploration is not apparent and cylinder rearing remains as nothing more than a trend in old animals. We are very grateful for the opportunity to have shored up the data set, and are relieved that (unbiased, statistical) over-interpretation of a low n has been avoided. We do not find the conclusions rest upon a ‘modest’ effect in young animals. The 25% increase in exploratory rearing is robust, as highlighted by the comparison of a high number of observations in all young animals (<6 months). In this submission, we discuss the data only in terms of significant genotype, age or age-interaction effects. This modest effect could have several causes and might not be related to 'increased exploratory drive' or dopamine at all. We did not endeavor to claim dopamine alterations had a causal effect, but that they were temporally correlated. In this manuscript we have attempted to limit speculation and discussion has been restricted to the minimum necessary to report the findings with context. The analysis of presynaptic glutamatergic function is muddled. The data presentation and text has been massively simplified and several conclusions clearly discussed. Moreover, the data do not support the conclusion that release probability is elevated at glutamatergic synapses on SPNs in young GKI mice. Having eliminated several possibilities, and found that the PPRs were different in the presence of quiniprole, we concluded that elevated PR was the most plausible explanation (see agreement from reviewer 3). However, in the current manuscript, we have endeavored to ensure it is clear that we ‘discuss the possibilities’ without endorsing specific conclusions. First, spontaneous EPSC frequency in ex vivo brain slices is complicated by a range of factors, including slice angle, which limits its information value. Second, the absence of an alteration in evoked PPR in the GKI mice argues that there is not a change in release probability, assuming that electrical stimulation and sEPSCs are giving a picture of the same synapses. We agree, and (previously and currently) discussed the findings in this light. We address all these factors openly in the manuscript. With respect to slice angle, we have previously been concerned about this, but found no effect of TTX on sEPSCs in our hands (See Milnerwood 2010, Supplement as detailed in text here). As a consequence, the conclusion that glutamatergic synaptic transmission is enhanced in young GKI mice is not justified. Regardless of the underlying cause (increased Pr, differences between miniature or evoked release, pathway specificity), glutamatergic transmission is clearly enhanced in young GKI mouse brain slices. This is not a subtle alteration, given a 47% increase in mean event frequency, as such I see no reason why it is unacceptable to conclude that increases are apparent. We hope that in the revised document (with discussion less robustly highlighted) the reviewer appreciates this. It would seem a major stumbling block for this reviewer may be that this study only partially replicates the results of a recent J Neuroscience paper by the Huntley and Benson labs (Matikainen-Ankney 2016). We discuss this in the document, and the Matikainen-Ankney et al.study contains some data that is very similar to our own at 1 month, but didn't show an increase in older slices (2 months, n not disclosed). There are several issues that preclude direct comparisons (e.g., homo vs. het comparison, WT background vs. littermates); however, while there was not a significant increase in mEPSC frequency (leading to a conclusion that actionpotential firing underlies all difference) in the Matikainen-Ankey study, this may be due to reduced power in highly variable data e.g., Matikainen-Ankey detected a strong trend towards increased mEPSC frequency (Figure 4.Ap=0.09, in a cell sample size of 16&20 neurons). Our observation numbers were higher in isolated 1 month data (n=24&36) and combined <6 month data (n=40&53). 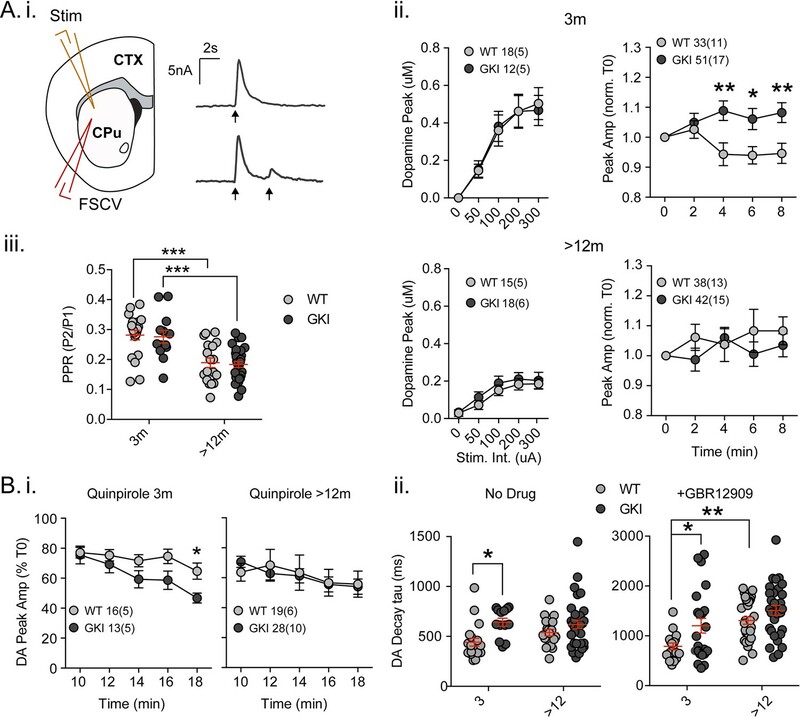 Although interesting, the effects of quinpirole are very difficult to interpret because there are D2Rs not just at presynaptic sites but postsynaptic ones as well, opening the door to all sorts of indirect neuromodulatory effects (glutamatergic terminals have a wide range of GPCRs capable of altering release). Were the effects of quinpirole on evoked glutamate release dependent upon SPN subtype? What effect did a D2R antagonist have on evoked properties? As we discussed previously, and in this submission of the document, there are several confounding factors to take into account when attempting to interpret the D2 agonism result; that said, it is unclear why this negates the ‘interesting’ nature of the observation. We found that Pr was different between two genotypes in the presence of the drug. We also explain how this is likely due to an effect on WT, rather than GKI, as statistically described. We have included more data in Figure 2—figure supplement 5 to show there were no obvious differences in event frequency of D1 and D2 expressing SPNs in GKI mice. As requested we have included data that show there was no differential effect of quinpirole on evoked amplitudes, nor PPRs, in D1 or D2 GKI SPNs. We feel this data goes someway to assuage concerns that post-synaptic cell type, or differential post-synaptic effects of quinpirole, might negate the conclusion that glutamate transmission is (transiently) elevated in GKI brains. It is also worth noting that these experiments are complicated by the use of intrastriatal stimulation (which activates a wide range of chemically distinct axons). Either cortical stimulation in parasagittal slices or optogenetic activation of cortical axons would have simplified this analysis. We do not shy from this fact, and this was noted in the original document. The reviewer complains that the study is too long and complicated, while demanding more ‘confirmatory’ experiments (on only half of the document’s contents). We maintain that the results are of interest, and agree that optogenetic activation and / or different slice orientations are entirely appropriate follow-up studies; but ones that are outside of the scope of the current manuscript, especially in a short report format. We have removed reference to altered vesicle cycling and availability. This is an interesting and well-crafted study examining the age-dependent effects of the LRRK2 G2019S mutation in mice on motor behavior and medium spiny neuron activity. The strengths of the study sit with the longitudinal analysis of the mice, the identification of mutation and age-dependent cellular and behavioral phenotypes and with the characterization of changes in dopamine availability. We thank the reviewer for their appraisal of the study’s general strengths. However, there has been some confusion regarding the use of the term ‘longitudinal’ (see reviewer 3), which suggests that the same animals were tested over time. This was obviously not the case for terminal experiments, but was also not the case for behavioural tests, in which the repeated exposure of the animals to testing might alter responses. These strengths are diluted by the failure to test the mechanism analyzed (DA availability) as a source of the changes in behavior or glutamatergic activity. We appreciate it would be ideal to test the link between dopamine availability, glutamate activity and behavior, but stress that this is already a fairly ambitious study (the financial cost of raising 12-18 month old mice alone is extremely high). We hope that condensing the manuscript down to a short report will help the reviewer conclude that the findings merit publication ‘as is’, with follow-up investigations to probe the mechanism for some of these novel observations. Novel and confirmatory results are presented in a way that is unnecessarily confusing and some of the statistics used are inappropriate. We have attempted to remove ‘confirmatory’ experiments, but consider some valuable for interpretation of the novel observations. This and statistical concerns will be addressed below. 1) The data show the LRRK2 G2019S point mutation can affect motor behavior in a cylinder and spontaneous EPSCs in SPNs (Figures 1, 2). Subsequent data (Figures 2, 4, 5) support that there are genotype dependent differences in dopamine "tone" in the dorsal striatum. Since the dopamine alterations reported could cause the altered motor behavior and influence cellular behavior, it is not clear why this mechanism was not tested directly at any age. Additionally, would LRRK2 kinase inhibitors be anticipated to "normalize" behavior and activity in GKI mice? We assume the reviewer wishes we conduct whole-animal pharmacology and test for alterations to behavior and neuronal physiology; that this should be attempted for dopamine modulators and LRRK2 kinase inhibitors. Firstly, now that we have a defined early phenotype in GKI mice it is plausible to conduct pharmacological experiments at the early time point. This is a very reasonable suggestion, but is a matter of breeding large cohorts of animals (especially for littermate comparisons) for use over several months. We do intend to do such experiments, and feel while they will add greatly to our programmatic aims; however, we feel they are outside the mandate for this manuscript, especially as a short report. For the assessment of LRRK2 kinase inhibitor experiments to be conducted this is even more so. While the third generation of LRRK2 inhibitors appear to be fairly selective, we would certainly need to include LRRK2 knock-out (and littermates) mice in comparison to the GKI mice (and littermates) in treated and untreated groups, over time. Many animals would need to be drugged independently of the actual experiment to assay resulting CNS levels and target engagement. Furthermore, there is the issue of when to drug animals; if drugs were only given to mice at phenotypic time points it may be informative if the hypothesis is proven, but if not it might produce a false negative. In other words, if differences are due to altered development, inhibitors would need to be given from a very early time point. We accept that these experiments should be conducted, but this will require many tens (even hundreds of mice) and it is perhaps better to publish the phenotypes we have already uncovered for a push by the whole field (including industry) to test their ‘druggability’. This is an important but not a small addition to our programmatic aims, but we feel this level of pharmacological investigation would require an entirely separate manuscript. 3) Performance in the cylinder test is broadly interpreted as hyper- or hypoactivity. This is not a typical interpretation of this test. Differences in rearings alone are insufficient to conclude the mice are hyperactive in their youth and hypoactive in old age and this oversimplification needs to be reined in. We have altered the text accordingly. (The slight decrease in "exploration" at 12 months in KI mice could support hypoactivity, but contradiction with previous work from this lab and others suggests that at best, this effect is weak). However, since rearing number reveals a genotype-dependent difference in young and old animals, the video data could (and should) be further analyzed. In addition to numbers of rearings, does duration change? Was there any evidence of forepaw dyskinesia (since forelimb wall contacts were measured)? Citation/s should also be provided for the method. A much improved older data set demonstrates that hypoactivity is not apparent in older mice. We could further analyse the cylinder test videos for further information at the reviewers’ suggestion in the short report; however, we are wary of over interpreting the data in the cylinder test (rearing itself is fairly unambiguous and simple to score consistently). We did also quantify grooming time and grooming bouts, but found no alterations. We have included recent citations for our own previous use of these tests, to which we could add, but this seems unnecessary. We do thank the reviewer for the suggestion and as we embark on future pharmacological investigations we will endeavor to take this advice into account e.g., forelimb dyskinesia has been induced by repeated L-DOPA treatment of mitoPark (but not control) mice (Gellhaar et al. 2015). 4) The idea that the G2019S mutation may be conferring early synaptic senescence is intriguing (Abstract, Discussion), but not well supported by the data. Changes observed in older WT neurons could reflect aging, but they do not occur earlier in GKI neurons (normal aging in both? ); other changes in GKI neurons are not matched by WT neurons (GKI pathology?). We have removed this phrasing from the document. We retain the observation for early changes in GKI that are matched by WT for the increase in dopamine extracellular lifetime. The statement that the mouse model "recapitulates data from LRRK2 carriers" (Abstract) is a stretch. At no point was a direct comparison (two groups, t-test) performed on grouped data (> two groups) for which there was not a significant ANOVA. Statistical analysis and presentation have been standardised throughout with F values included. Interpretation has been simplified, and other potential contributions discussed. Introduction and Discussion has been simplified throughout in this short report. 8) Why were electrophysiological recordings and FSCV conducted at RT? Temperature has effects on the measures recorded. While it is true that recordings are influenced by temperature (among many other variables), recording at room temperature is standard for assessment of basal physiological properties in slice preparations; conducting experiments at temperatures below 37oC prevents the build-up of condensation on electrodes which can cause stimulation and recording points to change over long time periods. Regardless, all conditions were constrained for all mice, slices, experiments and with the investigator blinded to genotype (the independent variable); we make no claims on absolute biophysical properties at physiological temperature. 9) Figure 3 does not add to what has been published by this group and others and could be deleted. Demonstrating that synapse numbers are unaltered is critical to interpretation of the data. No other group has assessed these measures in these mice, although similar findings have been reported in related models. With that in mind, these data are retained as supplemental. 10) There are also some errors in the Materials and methods describing LY fills and immunohistochemistry (LY and 488?). Where does Cy5 filling come from and what is examined in the Cy3 channel? Raster scanned image stacks are generally unreliable for intensity measures (Figure 5) – why not use a western blot for DAT (previous work in the lab shows TH is unchanged)? We apologise for confusion. A section of the Materials and methods contained elements of a previous Materials and methods section with some aspects incorrect for this manuscript. Cells were filled with Lucifer Yellow, or biocytin. Biocytin was visulalized by Cy3-conjugated streptavidin. I am unsure why the reviewer feels that the image acquisition is not reliable for DAT intensity (the stacks were constrained in every way, fluorescence signal is linear, and ‘background’ was accounted for relative to signal on the corpus callosum). We have additionally included semi quantitative western blots in the figure supplement, which demonstrate an increase in DAT (as shown very recently in similar KI mice by Longo et al. 2017). Regardless, the slowing of transients occurred in a very high concentration of DAT blocker, eliminating this as a possible cause of increased DA extracellular lifetime. 11) Example traces should be added to Figure 1A for the 12 or 18 month data where genotype-dependent changes in EPSC frequencies are observed. Genotype-dependent changes in EPSC frequency were not observed in the older group. […] My concerns are mainly with the range of statistical analyses employed that appear rather random in places, and that some of the conclusions may be lacking a solid data-based foundation. No outliers were removed from any data sets. In one group of animals, video data for one cylinder test group were corrupted. Added to this, on occasion mice of either genotype leap clear of the beaker and it is not found fair to include them in rearing analyses. Throughout the (current) manuscript, we have explicitly reported ANOVA main and interaction effects (with associated F values) and post test analyses. Generally statistical post-tests were determined by the nature of the data spread (regarding normal distributions). Otherwise, we were acting with knowledge of post-hoc testing being a sliding scale of significance. All post hoc analyses adjust for alpha in different ways and some are more stringent than others e.g., Bonferroni will make fewer Type 1 errors by testing each comparison by a harsh alpha adjustment. This has the unfortunate effect of being highly prone to false negatives due to the harsh alpha adjustment. Thus, which ANOVA post test is used informs the magnitude of confidence that type 1 errors are avoided, not whether data are ‘truly different or not’. To avoid confusion, we have standardized statistical analyses of similarly presented data throughout. DA levels were normalized to account for differences in HPLC runs, potentially between standards, but also with regards to length of storage prior to assay. There was no need to normalize ratio’s as they are internally controlled (within sample). In retrospect, should we conduct microdialysis in future, no-net flux technique will be employed. That said, we conducted the experiment to satisfy our own need to replicate the reduced DA levels found in the initial colony at Mayo, in the UBC colony and we have removed microdialysis data from the manuscript in the short report format. As stated in the Materials and methods n=cells or slices for voltammetry. The number of animals from which these cells/slices were prepared from is in parenthesis. This is standard practice. We hope that the revised document satisfies the reviewers concerns regarding the explanation for increased extracellular lifetime / transient tau, and the correct references. In addition to the immunofluorescence we have also included semi quantitative western blots in the figure supplement, which demonstrate an increase in DAT (as shown very recently in similar KI mice by Longo et al. 2017). It is unlikely that the slowing of transients occurred due to a deficit in DAT function as we used a very high concentration of DAT blocker, eliminating this as a possible cause of increased DA extracellular lifetime. We hope the reviewer finds the revised document better explained. We also believe there are plenty of reasons to consider this likely; however, due to concerns raised we have eliminated reference to vesicle recycling. We feel the document may suffer from a paucity of sensible speculation / discussion and welcome further suggestions in this regard. […] For further consideration, all reviewers felt that the interpretation that increased sEPSCs (in this study) are due to increased mEPSCs should be tested directly by recording in the presence of TTX. Just as important, a D2R antagonist should be applied to attempt to ameliorate the knock-in effects. These experiments in the 'young' mice will be required to bolster the impact to a minimum level for further consideration. Both of these experiments have been conducted and included as two supplemental figures. While strengthening the manuscript slightly, the conclusions remain unaltered. This has been addressed: representative blots are shown and an. xls document detailing the densitometry analysis is included. We feel at no point are phrases such as ‘age-related decline’ misused, and reflect the changes in the data. It doesn’t appear often, but does so as part of discussion and conclusion. Opinion in this regard is certainly a matter for debate, but we include no descriptive inaccuracies. We have reduced and simplified certain aspects of the introduction, but feel the message remains valid. We had non-experts read this text and have not received reports of difficulty with the narrative. We feel the document is clearly written, and while there may be some expectation for the audience to consider for themselves how the data sets are linked, this is done deliberately in order to maintain impartiality and avoid sensationalised ‘story-telling’, which plagues modern scientific publication. Age ranges have been more specifically reported as 1-3, 2 or 3 months within each data set. © 2017, Volta et al.